Great Falls Public Schools and United Way released detailed graduation and dropout numbers and shared plans to increase the number of students graduating on time next year and in the future. 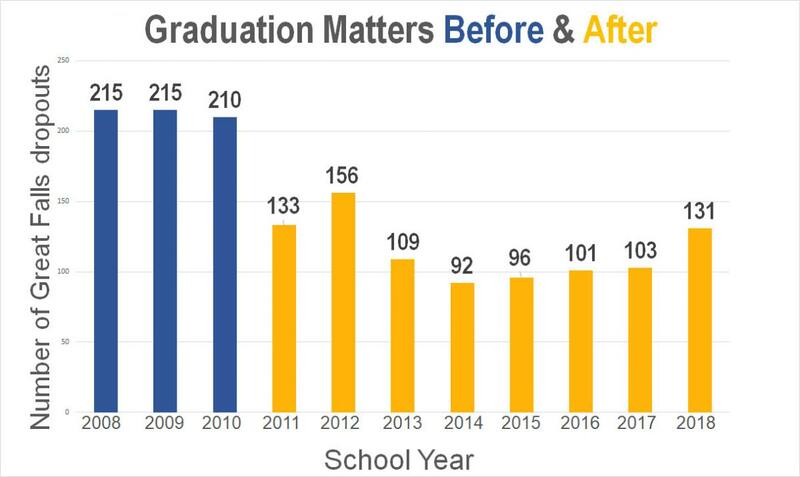 Last year, 80 percent of Great Falls students graduated on time – 8 percent higher than before the Graduation Matters initiative began eight years ago. Between 2005 and 2010, an average of 210 students dropped out of Great Falls public schools. A team of educators, administrators, community leaders, parents and students set the goal to cut the number of dropouts in half and increase on-time graduation to 92 percent. Last year, 131 students dropped out. Looking at the cumulative impact of eight years of Graduation Matters, 759 more students stayed in school to graduate – that’s the equivalent of an additional graduating class. 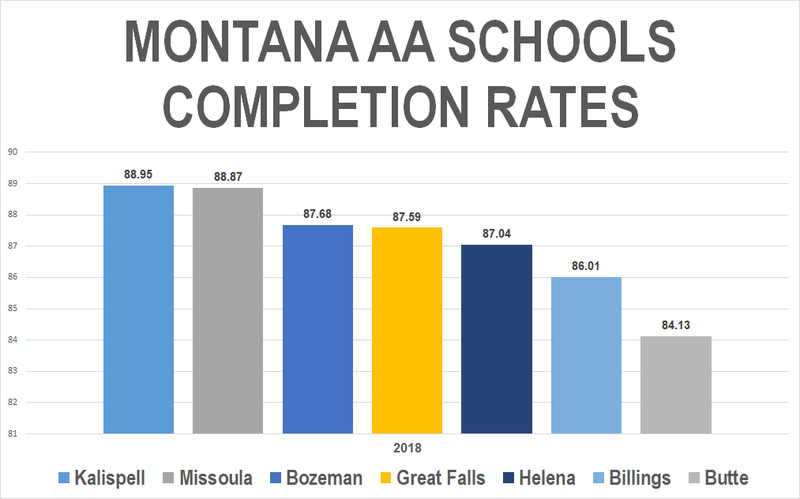 While the on-time graduation rate is what the state uses to compare districts, the Graduation Matters steering team said Great Falls’ completion rate, which is the percentage of students who complete the district’s graduation requirements in four years or more, more accurately reflects the district’s dedication to getting students to graduate. Last year, 87.6 percent of Great Falls students met graduation requirements, which is slightly higher than the state average and fourth among the state’s AA schools. The district’s highest on-time graduation rate was 84.5 percent in 2015, which was the year after the school mill levy passed. Since then, the district has made cuts to staff and programs. In the last 12 years, the district has cut 89 positions and $10 million. 58 percent of the dropouts were freshmen and sophomores. Some students never even showed up for the first day of high school. 46 percent of the students who dropped out were chronically absent, which means they missed 10 percent or more of their classes. While up 10 percent from before the Graduation Matters initiative began, American Indians students on-time graduation rate is 61 percent, significantly under the district average. Nationally 72 percent of Native American students graduate on time, the lowest percentage of any minority. Of the 131 students who dropped out, 26 completed the HiSET program. Another 22 dropped out intending to complete the High Set. Demand in the local job market makes the quicker HiSET program particularly appealing. Great Falls expelled a record number of students last year for safety concerns. Of the 131 dropouts, four were expelled. Two of those students have met the counseling and other requirements to return and are working to graduate. 97 students who dropped out were from low-income families. 18 students who dropped out were special education students. The district’s on-time graduation rate for special education students is 59.3 percent. The district has seen a sharp increase in the number of special education students with high needs over the last seven years. Attendance – Customized attendance plans begin in elementary schools. Schools go as far as picking students up to get them to school. The district has tried several creative attendance incentives and has sent nudge letters to elementary parents, but hasn’t seen lasting results. The Graduation Matters steering team is looking at a pilot attendance program that involves community members adopting neighborhoods to encourage attendance. Native American students – Paris Gibson Education Center is home to a new immersion school that gives American Indian students an opportunity to learn math, science, English, history and art while also learning about their culture. Homeless students – The district recently was awarded a grant that will allow them to hire a second homeless coordinator that can connect homeless students and their families to community resources. Career & Technical Education – The school district is working to promote and increase state funding for consumer and technical education programs. Students who specialize in CTE have a 97 percent graduation rate and are prepared for high-need jobs in business, construction, welding and more. Mental health – United Way helped connect the school district and the Community Health Care Center, now called Alluvion, to start school-based health care centers. Alluvion now provides licensed counseling services to students, saving the district $100,000 annually. Alluvion was also able to more than double the number of counselors available to help students with mental health issues. Mentors – United Way is currently recruiting mentors for a dozen high-risk sophomores as part of the Strive for Success pilot program. Professional mentors will help coach students to create a plan for their futures that includes graduation. United Way community impact coordinator Lacey Hallett met with high school and middle school principals to look for ways the community can help schools and students. For example, East Middle School needs help filming and editing students who are recognized for having a positive mindset. At North, United Way is helping recruit businesses to mentor student clubs. All community members can get involved by volunteering at a school, talking to students why attendance and graduation matter to their futures or creating job shadow opportunities for struggling students. Graduation Matters Great Falls employs cradle to career strategies that include increasing the number of kids entering kindergarten prepared and improving the number of 3rd graders reading at grade level or higher. The initiative engages parents, educators, students and community and business leaders to be involved in the success of our students. Great Falls has been recognized repeatedly by the Office of Public Instruction and the Governor’s Office for its innovative and effective ideas. Graduation Matters Great Falls invites parents, students and community leaders to get involved with the initiative. To learn more or to volunteer go to www.graduationmattersgreatfalls.org or call 727-3400. Each drop out costs our community nearly $260,000 in unrealized tax revenue and increased demand for public welfare. Nationally, each year's class of dropouts will cost the country more than $200 billion during their lifetimes and the cost increase to public welfare is $24 billion. High school drop outs are not eligible for 90 percent of U.S. jobs and consequently are four times more likely to be unemployed as someone who spent two or more years in higher education. High school dropouts earn on average $10,000 less than high school graduates and $36,000 less than people with a bachelor’s degree. Roughly 75 percent of crimes in the United States are committed by a high school drop out. A 1 percent increase in high school graduation would save roughly $1.4 billion in incarceration costs, or about $2,100 per each male high school graduate. High school graduates are seven times more likely to own their home. United Way fights for the health, education and financial stability of every person in every community. © 2019 United Way of Cascade County. All Rights Reserved.